I’ve caught myself on quite a few occasions overdoing my role as a parent. I’ve often thought about the fact that I want to give my children the world, wrapped up in an Amazon.com box and tie it off with a pretty pink bow. 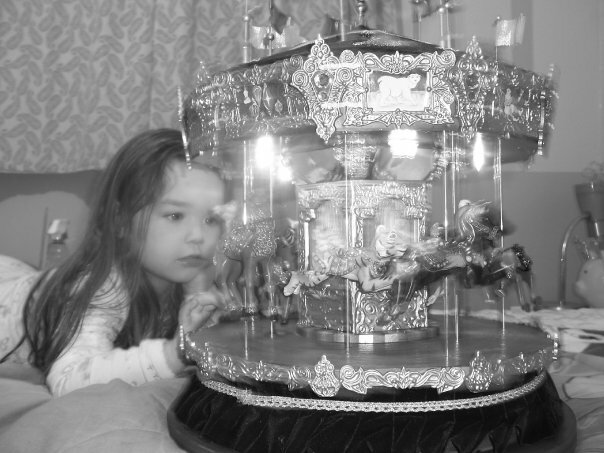 Several years back, my youngest daughter fell in love with a gilded toy carousel she saw on the Christmas shelf at a local store, so what did I do? I went back later and bought it for her, despite the $100 price tag, and later on, I surprised her with it, relishing in the shock on her face and the subsequent death-grip hug I soon found myself in. I was on top of the world. My wallet had brought my daughter boundless and unconditional happiness. What I wasn’t prepared for was what happened next. Putting the camera down, I stared at her expressions as she stared at the horses circling the merry-go-round, and I began melting into the moment. I savored every second that ticked by and marveled at her wonder and curiosity as she watched the tiny toy ponies galloping round and round. I noticed every uptick of the corners of her mouth as she noticed something new about the toy that made her grin, reigniting the happiness within. I climbed in, and she smiled again—the very same smile she had when she first saw my $100 present! As she snuggled up to me and buried her head in my arms, she sighed out a faint, “I love you, Daddy…” before closing her eyes and softening her breath. That’s when it hit me. It wasn’t my present—it was my presence. It was the gesture. It was the thoughtfulness. It was the fact that I had paid attention with purpose and listened. For but one moment in time, I made my daughter feel like the most important person on the face of the planet—more important than work, more important than my boss, more important than deadlines, and more important than money. Had she admired a pebble on the side of the road, and I went back for it later to get it and surprise her, I would have gotten the exact same effect. I remember wiping big, sloppy tears off my cheeks as I drank in the beauty of the moment, watching the rising and falling of her breath as she lay with me. Fast forward a few years, and a similar situation happened with my youngest child. I was walking through the store with my whole family in tow, and it had been a long, rough day. It was cold & rainy out, and the kids were all bored, which also meant they were cranky. It didn’t help that Mom & Dad were forcing them to go grocery shopping, something they absolutely hate doing. As I walked, hand-in-hand with my son, I set aside my own frustrations for a moment and started listening to his. Even at just 4 years old, a child can communicate his needs pretty clearly, but only if we, as parents, are willing to listen and put the pieces of the puzzle together. As he spoke, I started realizing that he was simply tired and a little bit hungry, as most growing boys are, 24/7. To help calm him down and make things easier on all of us, I offered to give him a shoulder ride, one of his favorite activities. Granted, I was pretty tired too, but sometimes, sacrifices are necessary for the good of the group. Despite the eventual burning sensation in my shoulders from carrying the equivalent of a giant sack of dog food on my back, this was one of the many happy memories I have of being a dad. My son felt comfortable and secure enough to trust that I would keep him safe, even way up there, precariously balanced nearly six feet above the hard concrete floor. 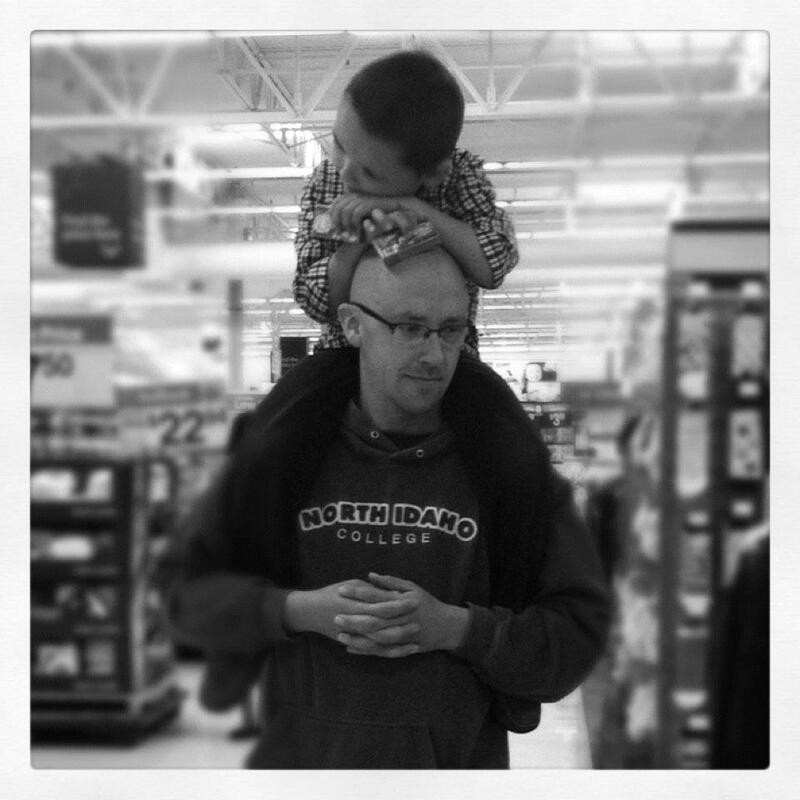 This trust allowed him to relax and lay on my head (which was another set of pains for my neck, but so very well worth it) as I carried him from one aisle to another. I know that, in the moment, I savored every second of that trust, which eventually transformed into deeply-seated feelings of love and appreciation. The ultimate point of these stories may be found in the Coleridge quote above. The “soon forgotten charities” of our littlest actions may turn into a lifelong memory. Some of the most memorable moments of my childhood are things that I highly doubt my own father would recall, but what each of them have in common are that they were moments of clarity—moments where he turned his attention to me and made me feel like I mattered, even if just for that moment. What will you do for your child to lift her up, either figuratively or literally? Do you think you could put the phone down, power off the computer, or turn off the television the next time your child has something exciting to tell you? What do you think could happen if you focused all of your attention on your child, just long enough to make him feel valued and heard? Give it a try—all it costs you is a little time and attention, but in the long run, I can guarantee you that your presence is the best present your child will ever receive from you. Turn and face them. You will not regret it. A pebble or a carousel… hm… yes I know what you mean about presents not needing to be expensive. One of the most meaningful gifts I ever received was a bookmark, it was from my first friend. Also I worry about parents who are looking at their iphones too often, instead of attending to their children. Now that “google glass” is coming, how many parents will be pretending to be present for their kids when they are actually subtly looking to the side at the little screen on those glasses? Or “glass”. I know what you mean. My 5-year-old found a penny on the street, and he was so proud of it, that he didn't stop playing with it in the car, until of course he dropped it. He wanted that one–not another penny, but the one he picked. So I looked for about 20 minutes in the car until I found it. I could have saved the world from alien forces and still not be considered as much of a hero as I was that day. The choice is ours as to what we pay attention to, but we need to remember that our attention ultimately shapes our children. If we ignore them, they will seek attention elsewhere and by other, less attractive means. What an awesome story, Oren! Thank you for posting it! I, too, have had plenty of those times, searching the car for some lost “treasure” that I couldn't care less about, but it meant the world to my child.